A beautiful maiden imprisoned in a high tower by her father Dioscorus for disobedience. While there, she was tutored by philosphers, orators and poets. From them she learned to think, and decided that polytheism was nonsense. With the help of Origen and Valentinian, she converted to Christianity. Son of Mansur, representative of the Christians to the court of the Muslim caliph. Apparently thrived as a Christian in a Saracen land, becoming the chief financial officer for caliph Abdul Malek. Tutored in his youth by a captured Italian monk named Cosmas. Between the Christian teaching from the monk, and that of the Muslim schools, John became highly educated in the classical fields (geometry, literature, logic, rhetoric, etc.). He defended the use of icons and images in churches through a series of letters opposing the anti-icon decrees of Germanus, Patriarch of Constantinople. Legend says that Germanus plotted against him, and forged a letter in which John betrayed the caliph; the caliph ordered John's writing hand chopped off, but the Virgin Mary appeared and re-attached the hand, a miracle which restored the caliph's faith in him. After this incident, John became a monk near Jerusalem. Priest. Anathematized by name by the 754 Council of Constantinople over his defense of the use of icons, but was defended by the 787 Seventh Council of Nicea. Wrote The Fountain of Wisdom, the first real compendium of Christian theology, along with other works defending the orthodox faith, commentaries on Saint Paul the Apostle, poetry, and hymns. Philospher. Orator; such an excellent speaker he was known as Chrysorrhoas ("golden-stream"). Last of the Greek Fathers of the Church, and the first of the Christian Aristotleans. Adapted choral music for use in the liturgy. Proclaimed a Doctor of the Church in 1890 by Pope Leo XIII. Son of a poor shepherd. Apprenticed to a shoemaker. Studied in Munich, Bonn and Cologne in Germany. Ordained on 10 April 1845. Chaplain of Saint Laurentius parish, Elberfeld, Germany from 1845 to 1849. 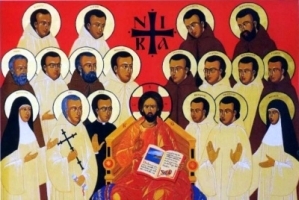 Founded several Catholic apprentice associations, one of which became the International Kolping Society with all its national and local organizations. Worked to improve the physical and spiritual lives of craftsmen and their apprentices. Worked with youth, and to improve family life. Vicar of the cathedral in Cologne. Rector of Saint Maria Empfängnis Church, Cologne in 1862. Son of Henry, count of Seez, Normandy, France. He received a good education, and became count of Seez in his own turn. Companion of William the Conqueror, and part of the force that invaded England in 1066. Following the Battle of Hastings, he was made royal chaplain and Earl of Dorset. Helped prepare the Domesday Book, an analysis of the resources of England. Chancellor of England in 1072. Between his duties of chaplain and chancellor, he received a great education in administration and management. Bishop of Salisbury, England in 1078. He took his duties seriously, concerned for the good of his diocese, even if many considered it conquered territory. His cathedral administration became a model for cathedrals throughout England. Believed to have initiated the Sarum Rite in England. May have written a biography of Saint Aldhelm of Sherborne, which has not survived, and approved his beatification in 1078. Knew and sought the guidance of Saint Anselm. Enjoyed copying and binding books. His areas of patronage derive from the miraculous healings that occurred at his tomb, and which paved the way for his canonization. A pious child. As a young man Anno became a soldier, and considered a military career; however, with the help of his uncle, the canon of Bamberg, he answered the call to religious life. He had a background in literature as well as theology, was an eloquent speaker, and considered quite handsome by writers of the day. Priest. Bishop and then archbishop of Cologne, Germany in 1055. Anno became a member of the court of Holy Roman Emperor Henry III where he was known for his life of prayer. At one point he became so influential that he drew the reprimand of Pope Nicholas II for excess involvement in civil matters. Following the emperor's death, Anno was made regent for the young Henry IV. Henry rebelled against Anno's strict discipline and had him removed. However, the young Henry's companions were so corrupt that reform was required; in 1072 they were all thrown out, and Anno was brought in as regent again. Anno supported the reforms led by Saint Peter Damian, and helped found monasteries in the region. He was involved in the disputes between Pope Alexander II and anti-pope Honorius II, supporting the legitimate Alexander and drawing the ire of many countrymen. Anno had his nephew, Cunon, chosen bishop of Trier, Germany; Cunon was opposed and then murdered by Count Theodoric. Anno spent his final years in Michaelsberg Abbey in Siegburg, Germany, praying and doing penance for this incident and others. Moved from Campi to Siena, Italy with his family as a child. He married and worked as a comb-maker. Widower. Franciscan tertiary, serving as a nurse in a Franciscan hospital. He continued making combs, living a simple, solitary life, giving any excess monies to the Franciscans, and spending his nights in prayer and meditation. He eventually moved from a layman's house to a cell in the monastery that ran the hospital. He considered himself too talkative, and worked to living in silence. Pilgrim to holy sites in various Italian cities. Known as a mystic and a miracle worker, he became a sought after advisor to priests and laity. The character of Pier the comb-seller in Dante's Purgatorio may have been modeled upon him. Youngest of seven boys born to Luigi Foschi and Angela Calabria. His was a poor family, and his father died when Giovanni was only 9 years old; the boy had to leave school and become an apprentice. He eventually received some tutoring from a local priest, and was able to finish high school. Soldier. Priest, ordained on 11 August 1901. Rector of San Benedetto del Monte in 1907. Started a series of homes for abandoned adolescents throughout Italy. Founder of Congregation of the Poor Servants of Divine Providence, which received diocesan approval on 11 February 1932, and papal approval on 25 April 1949. Frequent correspondent, in Latin, with the author C. S. Lewis. Born to the nobility of Berry, France; son of the Count of Bourges, a man who later became bishop of Tours, France. Part of the royal court of Clothaire II, serving as cup-bearer. Feeling a call to the religious life, Sigiranus refused an arranged marriage and took holy orders in Tours in 625. Archdeacon in Tours. Upon his death of his father, Sigiranus gave away his fortune to the poor; because of this, he was certified insane and locked up. Upon his release in 640, he made a pilgrimage to Rome, Italy, working with the serfs in the fields as he travelled. Founded the monasteries of Saint-Pierre de Longoret and Méobecq Abbey (later Saint-Cyran-du-Jambot) in the diocese of Bourges, France on land given to him by Clothaire. Monk and then abbot at Longoret in 655. Teacher at the Catechetical School in Alexandria, Egypt. He trained the famous theologian and teacher Origen. Writer and confessor of the faith. 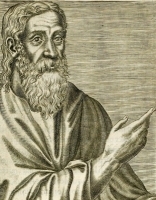 During the persecutions of 202, Clement fled to Caesarea, Cappadocia where he governed the diocese during the imprisonment of his student, Bishop Alexander. Jesuit priest. Sailed as a missionary to Japan shortly after ordination, but due to a series of problems, took six years to arrive, landing during a persecution of Christians. Spent twelve years working with the Nagasaki Christians. An edict in 1614 expelled Jesuits and ended Catholic missions in Japan. Jerome went into hiding in Nagasaki, and ministered to Japanese Christians in secret, disguising himself as a merchant. In 1623 he was found out by the authorities, and martyred with 47 other Christians. No information of his early life has survived, and the first we hear of Sola he is a monk in England. He immigrated to Germany where he became a spiritual student of Saint Boniface. Ordained by Boniface. Hermit near Fulda, Germany, and later at Eichstätt, Germany. At each place he attracted would-be students. At Eichstätt there were so many who stayed that Sola founded the abbey at Solnhofen, Germany, for them; he spent the rest of his life there. An obviously allegorical legend says that one day while riding a donkey, Sola saw a field of sheep with no shepherd; the sheep were attacked by a wolf, Sola ordered his donkey to fight off the wolf, and saved the flock. Joined the Franciscan Friars Minor in 1591. Missionary to Manila, Philippines in 1609. Missionary to Japan in 1612. Forced to return to Manila in 1614 due to the persecutions in Japan. In 1618 he dyed his skin, assumed a disguise, and returned to evangelize Japan. He worked there for several years before being captured and martyred. Member of the Florentine nobility. Benedictine Vallombrosan monk. Abbot of San Salvi monastery. General-superior of the Vallombrosans. Created cardinal by Pope Urban II in 1097. Papal legate. Bishop of Parma, Italy in 1106. Exiled twice during disputes with anti - papal forces opposing Pope Saint Gregory VII, and with those who supported Conrad II as king of Germany, but considered a successful bishop. Niece of Saint Engelbert; Ada's whole family was known for its piety. Nun at Soissons, France. Abbess at Saint Julien-des-Prés abbey, Le Mans, France. Bishop of Maiferkat, Mesopotamia. He reorganized the Church adminstration in Syria and Persia. Collected the stories (called the Passiones) of Syrian and Persian martyrs. Hymnist. Friend of Saint John Chrysostom. Benedictine monk of Corbie Abbey, Amiens, France. Spiritual student of Saint Adelhard. Bishop of Beauvaus, France in 821; he served for 25 years. Signed and supported the decrees of the Council of Pris. Ministered to his people during Norman invasions. Bishop of Polybotum, Phrygia. Defended orthodox teachings and the use of images against emperor Leo the iconoclast. His reputation as a miracle worker was such that the emperor feared to act against him. Buddhist monk. Convert to Christianity. Lay catechist. Jesuit. Martyr. Brother of Saint Plutarch of Alexandria. Spiritual student of Origen. Succeeded Origen as the head of the catechetical school at Alexandria, Egypt. Patriarch of Alexandria in 231. Officer in the Byzantine imperial court of Leo the Armenian. He was arrested with three others officers for treason because they opposed Leo's Iconoclasm. The other survived the torture and imprisonment and became monks, but Theophanes did not. Martyr. Late 3rd-century bishop in Pontus (in modern Turkey); known as an eloquent speaker. He was frequently abused for his faith during the persecutions of Diocletian, but there are no records of him being a martyr. Abbess of the Columbanian house of Notre Dame de Sales, Bourges, France from 612 until her death. Spiritual student of and deacon for Saint Ambrose of Milan. Bishop of Bologna, Italy. Seventh century hermit in the forests of Brenne, France.